b) how cooking processes transform the nutritional value of the food we eat. Task: Students will select a natural food item, compare it with a cooked/processed version of the same item, and demonstrate the nutritional impact on the body. Activate Prior Knowledge: Ask the students as a class whether they think they eat properly. Have students write down yes or no on a scrap piece of paper and have them put their answers into a bin so you can record the results on the board in an anonymous way. Review with the class the categories and contents of the Canada Food Guide. In partners, discuss the food guide. Ask what two areas the students feel they are most likely to eat the recommended amounts. Have students share the information with the class and graph the results on the board using a food grid. Question: What are the five different types of nutrients one can obtain from food? Students discuss their ideas with a partner and report back to the class. Using the McGraw-Hill Ryerson textbook BC Science 8 (pages 64-69) or other classroom/internet resources, small groups investigate the five different types of nutrients obtained by food. Small groups should be 3-4 students. Some groups will have the same topic. Topics include: carbohydrates, proteins, fats, minerals and vitamins. Students must identify the function of the nutrient as well as examples from the food guide. Use the nutrient wheel to track their thinking. Students must share information with the class allowing others to complete their nutrient wheels. In their same small groups, distribute copies of the Coastal B.C. Native Food Guide or food guides that reflect other cultures. Students discuss what foods are not included in the Canada Food Guide and add examples to their nutrient wheel. Video: Students view the movie. Guiding Questions: Do students think the nutrients will change when the fish is smoked from when it is raw? Why is smoking fish important/necessary? 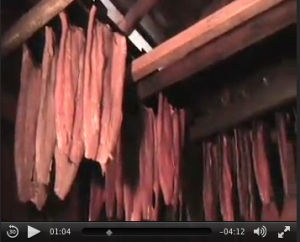 The smoked fish in the video is Chum, but Chinook is close enough for comparison. 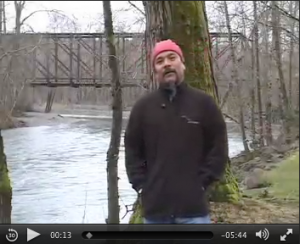 Print out a nutrition guide for raw Chinook and smoked Chinook to compare. Students in partners or their previous small groups compare the information and discuss key differences. Students, in partners, will select a natural food item, compare it with a cooked/processed version of the same item, and demonstrate the nutritional impact on the body. An example may be a potato and McDonald’s french fries. Students can use the Nutrition Data Website to select and research their food information. Criteria should be developed with the class to determine the depth and completeness of the components required. How students present their learning can be up to the teacher or students. Examples for demonstration include: posters, debate – one partner argues for the potato and one argues for the french fries, t-chart, video, radio/TV commercial, written report, etc. Students can reflect on their own eating habits and set personal goals for healthier eating choices. Students can make their own personalized food guide. Students could also find other foods they commonly eat on the Nutrition Data Website and analyze what these foods give them for nutrients, or create their own food list for a 24 hour period and analyze whether they got enough or too much of the different nutrients. This entry was posted in Science and tagged Compair and Contrast, Media Presentation, research on May 4, 2015 by Dan Norman. Complete a What’s Important and Why organizer on an article discussing gold mining in Guyana. Watch a video and complete a Graphic Organizer. Students read articles independently, or in A/B partners, and look for the key ideas. Once students have completed reading the articles, teachers brainstorm the key ideas from the articles on the board. The Aboriginal populations of Guyana in South America have also experienced hardship as a result of governmental and corporate policies. One example is the effects of corporate mining practices in Guyana and the Guyana region of Venezuela. Teachers print out and distribute the article Gold and Native Rights in the Guyana region of Venezuela. Students form A/B partners and complete a What’s Important and Why organizer for the article. Students research other global indigenous populations and their efforts to preserve their culture and way of life. This entry was posted in Uncategorized and tagged Compair and Contrast, Media Presentation, research on March 2, 2015 by Dan Norman.